So last week saw me flying out to Israel last minute to show my support for my Rabbi who lost his mother and to show my support for a country that is under fire. Having just returned, I wanted to reflect back on my feelings and state of mind (as a person who loves Israel), and to help others understand the state of mind of the people living in a country so deeply rooted in its history. Let me start by saying that I do not normally speak politics on this blog and I am not trying to project anything here. This posting is like all my posts – my personal diary on what I tasted, felt, and heard during my week in a country at war. Please understand the settings. First this trip happened during the three weeks and nine days, two sets of the saddest days in our history, which culminates on Tisha B’Av (the day of the destruction of our holy temple) – which is in a few days. Jewish history is not a linear timeline, it is rather a spiral staircase where each day reappears a year later. The days starting in the three weeks are not days of joy, because those very days are littered with historical fact after historical fact proving the days are bad for Jews and Gentiles alike. I do not like to travel in the three weeks, it always turns out badly, broken cameras, cars breaking down, insane traffic out of nowhere. Essentially, it is like living with Murph on steroids! But, family and friends are not just a convenience for when things are going well, they are a part of your life no matter when and where you are. So, when I heard my Rabbi’s mother passed, I decided it was time to visit the Holy Land – no matter the circumstances. I will not bore you with the last minute planning and miles tickets that popped open out of nowhere, because of the war – essentially it was Murphy’s Law tempered with good luck – an interesting combination to say the least. Before, I made it to Israel, I heard the news and I heard the stories and friends told me it is dangerous, it is not a good time to go – my response was – THIS IS THE EXACT TIME TO GO! This is the time to show our support for a land that is littered with history of our forefathers and their fore-parents! This is a place that is imbued with our physical lives and memories – to a point that one cannot turn away when sorrow is near. The trip was uneventful, thankfully Murph was a no show! 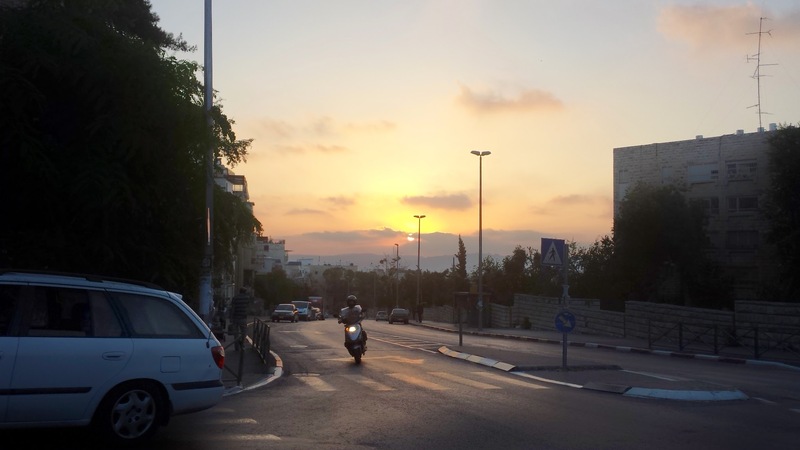 I arrived into Israel a few minutes early – thanks to good winds and tidings, and I got my car and drove to the shiva house, where my Rabbi was “sitting” for 7 days. It was here where I started to take in the atmosphere that is Israel, to be around people who were there for the correct reasons – in this case – to console a family that was part of the larger Bnai Brak area for more than 50 years! My Rabbi told me stories of when he was young and he could open his windows and see the ocean, that is not the case any longer. Bnai Brak has grown and expanded to fill the entire area around Ramat Gan and its surroundings and no matter where you go in Bnai Brak, The Chazon Ish is almost everywhere. He passed away before my Rabbi was born, but he told me stories of how he had classes in the Chazon Ish’s house, and played in his backyard. The environment may have been one of sorrow, but the mood was one of hope and transition. Clearly, there were times where the people coming to console the mourners had to run to shelter when the sirens went off, a warning of potentially impending attacks. Thankfully, though Bnai Brak and Tel Aviv have been attacked countless times by missiles, the Iron Dome has done its job in protecting its inhabitants. After spending many hours, I made my way to Jerusalem, where I was staying and meet some friends and went to sleep. The next day, was truly one of my more sad days in a long time. I was not in the mood of going to wineries, I wanted to visit my Rabbi again, but things did not work out – as it turned out that Israel had started its offensive into the Gaza Strip, and in the fray, a fellow American citizen, Max Steinberg, had sadly fallen. He would be one of many more, that bravely gave of their soul for a country yearning for life – a truly sad twist of fate. 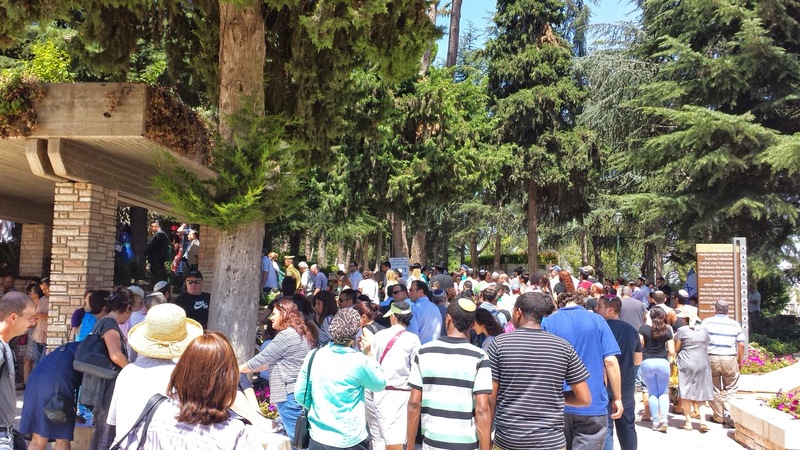 He was being buried a few miles from where I was staying so I and some 30,000 other people, from many different walks of life, made their way to Herzl Memorial Cemetery to pay our last respects to a fellow Country man – who paid the highest cost for a country he felt deserved his time and immense talents. The ceremony was moving in both English and Hebrew, no dry eyes were present that day, all the people I saw, were deeply moved and were there till the last minute to pay tribute to a person who loved the country as much as they all did, and did so till his last dying breath. Sadly, another soldier passed as well, Dmitri Levitas, and he was also buried in Mount Herzl a few hours later. Going to two funerals in a day, reminded of my last trip to Israel, where right before I left, hours before my plane trip home, I sadly went to two funerals, less than 24 hours apart, of friends and family, both buried in the Bet Shemesh cemetery. I was not expecting my last visit’s sorrows to engulf me again, but that is the three weeks, that is the cycle of time which we cannot control, and that is what living is all about. I was truly down at that point to say the least, but again, it was the people in this country, hard nosed people, people who live in a land filled with grief and hope, that saw me through it all. One never really is alone in Israel, you may think no one knows you or no one sees you, but that could not be farther from the truth. So, with a heavy heart, I went out to dinner that night, and it was there that I started to see what the country is truly facing. You must understand that this is the summer, and though it is a bit warm (laugh track..), people live for being outside and in the environment. Till now, I was at large group gatherings and had not yet really been to see the land or the shops or the parks. One word would sum up what I saw; vacant! How could people play in the streets or in parks, when you had less than 30 seconds to run to shelter? How could one feel safe and wish to be around when you were always looking for a shelter when you entered a new area or location. 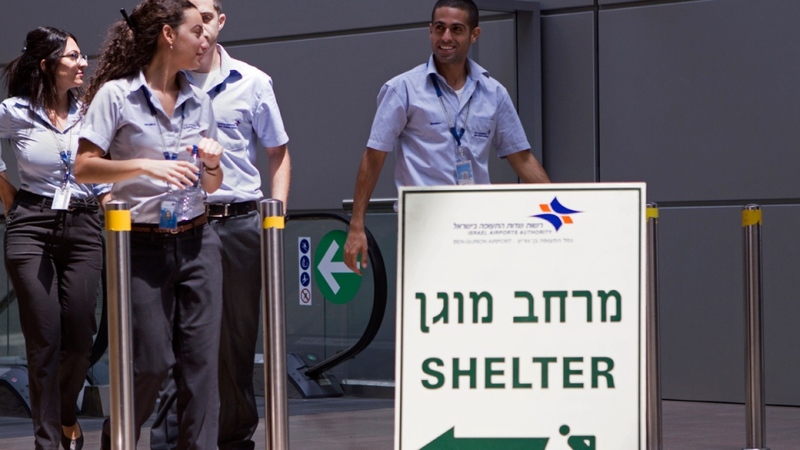 In the airport – the first sign I was greeted with – was not welcome to Israel – but rather shelter! 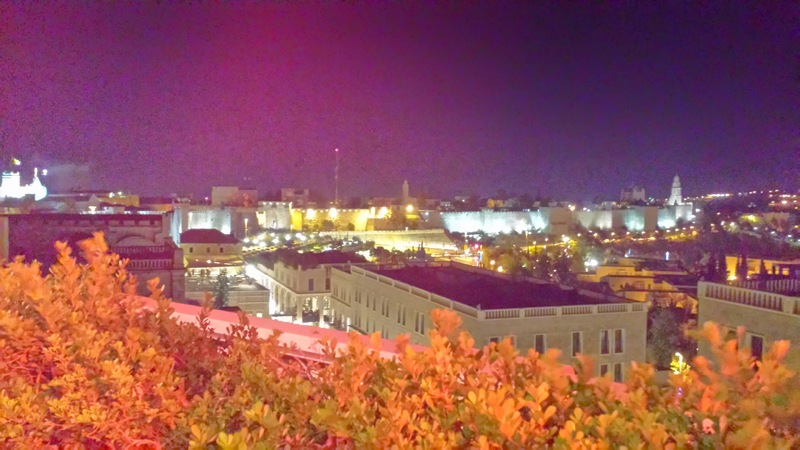 Dinner with my friend was at a lovely restaurant, called the Rooftop on top of the Mamila Hotel, overlooking the walls of the old city – beautiful to say the least. The food was great but the place was deserted. There were three parties there that night, including ourselves! It was so sad, and a sight that repeated itself often. The mindset was clear – we are going to persevere, we are not going to let the war dampen our spirits, but we will attempt to stay safe and keep our children safe. In the end, the saddest aspect of this war, beyond the unimaginable suffering, and lost lives, is the psychological battle that is being waged – terror is its name, and from what I saw, terror was impacting lives but Israelis were not going to let it define them. I borrowed that mindset throughout my visit – sure it was sad to see fewer people out and about, but there was still many who went about their normal lives, with a watchful eye for the shelter signs. The next few days saw me visit many wineries and spend a lovely shabbat with my family in Jerusalem. The take away I felt was that for most wineries 2013 will be the best year in a LONG time in terms of white wines. Ella valley, Flam, Tzora, Yarden, Tabor, Teperberg, Recanati, and Lueria. Along with rose wines that are beautiful from Netofa, Lueria, Recanati, Agur, Dalton, Flam, and others. For me, the winery visits I made, were all tempered by the impact of the war. I tried to get to other wineries and the response was – we are closed because our people are on the front or supporting the troops. These courageous souls are living their lives while saving so many others. Also, many of the wineries were starting or about to start the harvest and crush – so the combination of the war and the winery in deep action minimized my winery visits, but the ones I did visit are showing that 2012 and 2013 are indeed going to be fantastic years fro Israel. 2009, 2010, and 2011 were all trying years for different wineries, some wineries like Teperberg had trouble with 2010, while it crushed it in 2011. Some had issues with 2009 and 2010 like Yarden with overripe and out of control red wines. But they seem improved in 2011. Sadly, the clear goto wineries of old, had issues in the tough years, but the super stars like Yatir, Tzora, Flam, and others weathered the storm far more calmly and consistently, separating the men form the boys. In the end, my take away is that the war that is attempting to define the country is galvanizing it in ways that are truly beautiful. Horror is not in the streets, it is not in the mind of its inhabitants, hope and resolution are the only things that I saw running through its streets, and I am sure the country will come out on the other side of this stronger, more resolute in its direction, with a deeper understanding of life and peace. Posted on August 1, 2014, in Israel, Israeli Wine, Wine. Bookmark the permalink. Leave a comment.